The European Union is trying to make its copyright rules fit for the digital age - but the negotiations about the EU Commission's proposal for reforming the EU Copyright Directive are proving difficult: there is still no agreement on controversial key articles, which could have significant consequences for freedom of expression and the way we interact online. The most frequently listed names are: IFPI - Representing recording industry worldwide (37 meetings) whose members include Sony Music and Warner Music, followed by the Federation of European Publishers (27) which represents national associations of book publishers, and GESAC - the European lobby for collecting societies (25), whose members include big EU collecting societies such as PRS for Music, the US giant recording label Universal Music Group International (22), and the Society of Audiovisual Authors (22), which represents national collecting societies. A Cabinet member of MEP Marinho e Pinto, Portuguese MEP from ALDE, for instance, told us that “All parties were extremely active since 2016” and “we got infograms, studies, surveys and invitations for seminars, etc”. However, what they called “the lobbyists against the reform (...) were aggressive as to spam mailboxes with thousands of e-mails per day, hacking Mr. Marinho e Pinto social media as well as the Wikipedia page.” The MEP supported Article 11 and 13 and that put him as the focus for online trolling in Portugal which included having a vulnerability of his wordpress blog being used to send out embarassing tweets from his personal social media account. This is obviously concerning and counter-productive but unlikely the result of a coordinated lobby effort. From the lobby meetings lists referred to earlier, several actors stand out, including German public-service broadcasters ZDF and ARD and publisher Axel Springer. The latter company, and especially its CEO, Mathias Döpfner, seem to have been crucial in the copyright discussion, as the publishing company is a vocal critic of the power of big US tech (GAFA - Google, Apple, Facebook and Amazon), with whom they compete for the online advertising market. Springer’s links with the CDU/CSU were also useful when MEP Voss was nominated to take over from Comodini as the lead MEP on copyright. At that time, Voss had a meeting with Oettinger, who by that stage had already moved to a different Commission portfolio but was still following the discussions, and Matthias Döpfner, Springer’s CEO. According to Oettingers briefing notes, at the meeting Döpfner was expected to “raise questions about the Commission’s position regarding Ms Comodini’s draft report”, the one that had deleted the 'neighbouring right', and Oettinger was prepared to say that they continued to expect the same level of ambition from MEPs as the Commission had shown. This is a highly problematic and flawed interpretation of the Transparency Register. Google’s entire self-declared lobby budget does make it one of the EU’s highest spending lobby groups. However, only a portion of the declared €6 million would likely be spent on copyright, especially as Google is also fighting several other significant lobby battles in the EU (for example on the anti-trust law cases being brought against Android, digital tax, terrorist content, fake news etc). According to available meeting data, it looks like most of Google's lobby meetings were in fact on other issues from the Copyright Directive, so it appears that this is not their priority at the moment. Measures in the field of 'legislative footprint' would also help to clarify what is going on in terms of lobbying on the Copyright Directive. Lobbyists could, for instance, be required to submit policy papers and other lobbying documents to a publicly accessible online database. All of these actions were clearly labelled as EdIMA’s, but were in fact designed by the public affairs consultancy Red Flag, which declared receiving at least €100,000 in 2017 for such work. EdiMA itself declared a lobby budget of €300,000 - €399,999 for 2016-2017, but this does not reflect what they actually spent lobbying on copyright so far. Those numbers will be updated only in next year’s lobby declaration, and they will likely increase. This coalition coordinated the Save Your Internet campaign, which brought up the threat of web filters and their potential consequences for freedom of expression. Once the discussion on web filters became more intense, C4C was accused of being an astro-turf organisation for the tech lobby and particularly for Google. For instance, in August, the Frankfurter Allgemeine published a long comment article entitled “Anatomy of a Political Hack” which claimed that “American companies from the internet industry are funding substantial parts of a campaign in Europe to influence EU legislation. 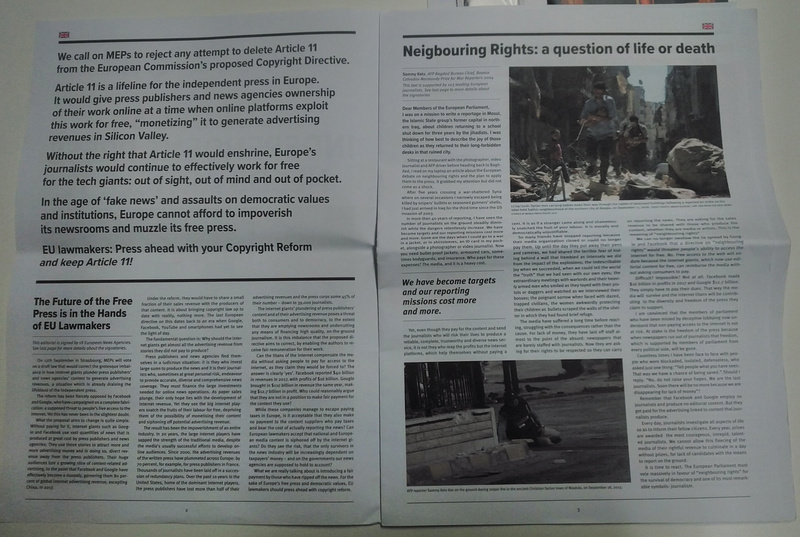 The campaign should look like a grass-roots movement to the outside world, but it is only astro-turf.”8 This long comment piece was authored by Volker Rieck*, the owner of File Defense, a company fighting online piracy, according to Rieck, the company limits "the visibility of works on illegal platforms"* (edited 18 December 2018). He wrote two other opinion pieces in the Frankfurter Allgemeine attacking the NGOs and citizen involvement in the anti-filter discussions, even publishing an English translation on his blog, which was then shared by the Federation of European Publishers and others. Harsh words were thrown at the C4C mailing tools, from arguing that they were nothing but spambots, to it being called a denial-of-service attack (DDOS) - a tactic often used by hackers to shut down websites. For example, see again the comment piece which Volker Rieck* penned for the Frankfurter Allgemeine. He wrote that parliamentarians were “being bombarded with emails and calls from allegedly concerned citizens. But the truth is another story”. Even though this organisation directly attempts to influence the EU institutions, Netopia is not registered as an EU lobbyist. The lobby firm MSL Brussels does declare the website to be one of its lobby clients. According to MSL's website, Netopia hired them to “enhance the impact of the creative industries [...] among EU institutions and Brussels-based stakeholders.” MSL runs the secretariat of Netopia and put together a range of lobbying activities which they claim were sucessful in increasing Netopia’s profile in EU institutional events and in EU media. MSL even says that the “EU recently adopted legislation that takes into consideration the copyright model supported by the creative industry.” According to MSL’s declaration, Netopia paid them at least €50,000 in 2017. Lumping in big industry players like Google with every other critical voice, such as NGOs and activists, and then tarnishing them both, was a successful strategy in this debate. Using this approach, all criticism, regardless of where it came from or what it focused on, could simply be dismissed. This was not just done by marginal figures like Netopia, but was also replicated by the established lobby actors. For example the Chief Executive of collecting society PRS for Music wrote a long blog on Linkedin in July 2018 where he criticised “the internet giants and the consumer organisations they fund” for spreading lies to safeguard GAFA’s profits. 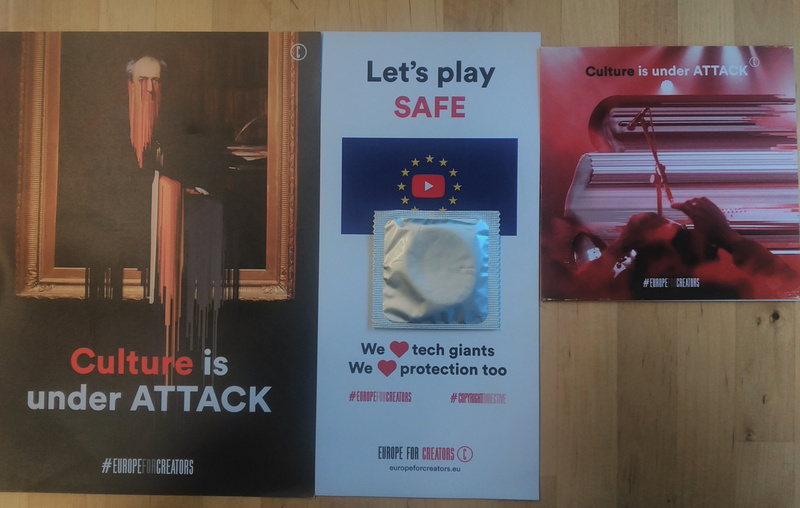 One of the pamphlets from Europe For Creators also made a point of stating: "We are people, not bots". Now, it has started its public offensive against Article 11, with Google News' Vice President, Richard Gingras, publishing a blog clarifying that their goal is that the directive includes the right for publishers to decide whether "to waive the need for a commercial license for their content." This is being matched with a round of media work where Gingras is refusing to say the company won't close the service if the measure is approved. 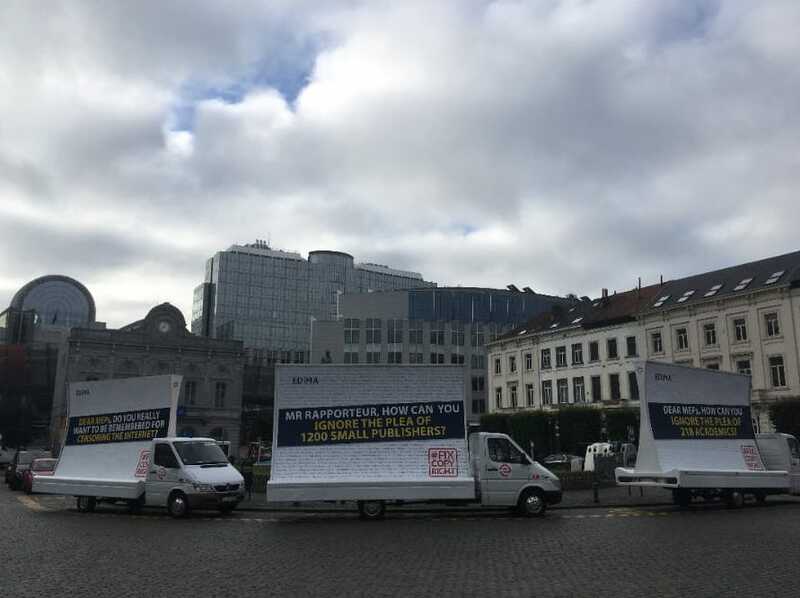 The copyright vote clearly illustrates the weaknesses of the EU’s current lobby transparency rules - it is still nearly impossible for citizens to adequately assess who is actually lobbying on what issue and with what budgets, in real time. And now we face additional lobby tactics such as misinformation campaigns based on confusing technical language to discredit authentic criticism, as well as the power of big tech who have their own platforms which they can use to push their own policy goals. It is clear that these significant business lobbies representing big tech, publishers and collecting societies have completely taken over the public discussion on the merits and pitfalls of the Copyright Directive. As collateral damage of these lobby strategies, the criticism of the Copyright Directive from civil society organisations working on human rights, consumer rights and open access to knowledge, libraries, the inventor of the World Wide Web Tim Berners-Lee, input from academics, the UN Rapporteur for Freedom of Expression, and now almost 4 million citizens who signed a petition against content-filtering, have simply been ignored or dismissed. Google lobbying : how about national registers? That said it's also harder to track, right? The publishers' lobby was more institutional, thus easier to follow through mechanisms like lobbying registers. Have there been other groups than C4C heavily lobbying MEPs where suspicions of astroturfing have been voiced? Reply to : Google lobbying : how about national registers?